Danversbank selected The Melton Agency after a creative shoot-out that included several Boston agencies. 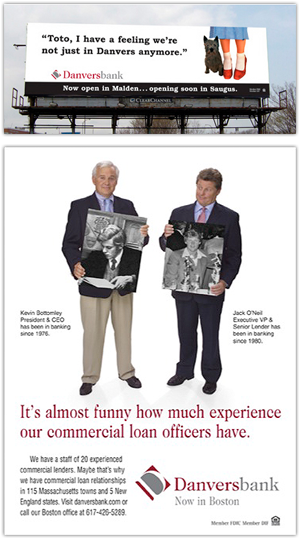 The agency created a variety of award winning advertising for Danversbank that included TV, radio, print, direct mail, online and outdoor. According to David Munroe, VP of Marketing, “Danversbank got excellent results working with The Melton Agency. They created advertising that really broke through the clutter; helping us to develop a unique personality for our brand. We heard lots of positive feedback about the work Melton did for us. The bank worked with The Melton Agency for 3 years before being bought out by a larger bank. In that time, the bank grew from $800 million to $1.4 billion in assets.